The eastern U.S. and basically all of Canada are the most anomalously cold places on the planet right now. Temperatures are up to 40 degrees Fahrenheit below normal for this time of year. Ottawa is the chilliest capital in the world this week after overnight lows dipped to minus-20 degrees Fahrenheit. International Falls, Minn., dubbed the nation’s icebox, hit minus-36 degrees Fahrenheit on Wednesday, a new daily low record. Mount Washington in New Hampshire also saw temperatures in the minus-30 degrees Fahrenheit, but the wind chill made it feel like minus-88, which just no. The miserable chill is likely to stick around and even deepen in some locations through the first week of January. In the Great Plains, cold is forecast to be life-threatening through New Year’s Eve with sub-zero daytime highs. No amount of liquor could ever convince me to go to Times Square for the New Year’s Eve ball drop, but especially not this year. The forecast low on Sunday night is 10 degrees Fahrenheit, which would put this year among the coldest in recorded history. Most land areas on Earth are warmer than normal. While we’re looking at temperatures up to 40 degrees Fahrenheit below normal in the eastern U.S., parts of the Arctic could reach up to 40 degrees above normal in the coming days. A slew of land from North Africa to China is taking a break from winter with temperatures 15-20 degrees above normal. 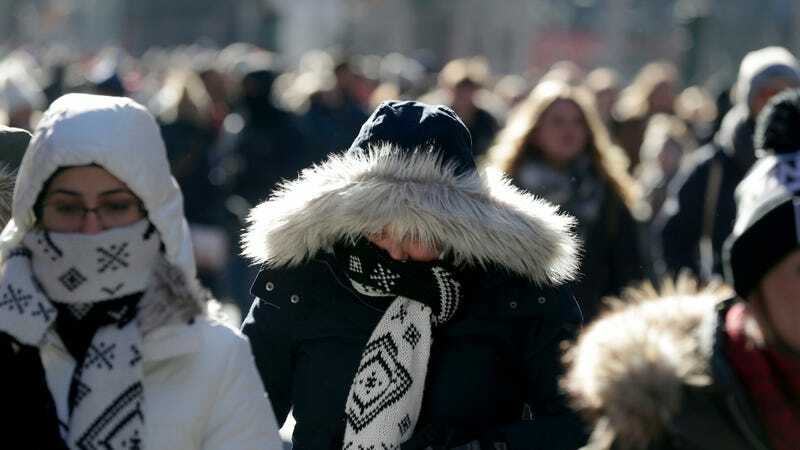 Even the western U.S. is getting a reprieve from the chill. Some research has linked dwindling Arctic sea ice and the rapid warming of the region to these types of wild jet stream patterns that can lead to divergent weather. Normally, the wide temperature gradient between the mid-latitudes and the Arctic help keep the jet stream running predominantly east to west with those slight variations. Because the Arctic is warming twice as fast as the rest of the globe, it may not be holding up its end of the bargain in maintaining an orderly atmosphere. The shrinking temperature gradient between the Arctic and the rest of the world means the jet stream has the potential to get more crazy. You can think of it like hold a string between two fingers. If you you strum the string while holding it taut with equal force on either side, it doesn’t move much. But loosen your grip on one end, and the string suddenly has a lot more leeway to move and wobble. The research on this phenomenon is still very much ongoing. It is notable that this winter has been a warm one in the Arctic so far, though. That’s inhibited sea ice formation in the region, further messing up temperatures. Understanding the potential cause of this godforsaken cold might do little to take the edge off. Ditto for remembering our planet is heating up at an alarming rate. This post has been updated with comments from Bob Henson.